Bearing witness to the accelerating negativity of global affairs, Steel Pulse emerges with musical vengeance to halt the disarray of humanity. The bands twelfth studio production, titled Mass Manipulation, reflects four decades committed to bettering mankind through music. Steel Pulse continues to be revolutionary in engaging controversial topics of racial injustice and human rights on a global scale. Their musical stance and conceptualizations are as potent and relevant today as they were at the beginning of their career. The album’s uniquely thematic approach provokes thought as it presses forward, toward humanities unification. A manipulation of our minds has been influenced by a New World Order currently dominating humankind. Steel Pulse reappears at a fated moment, armed with compassion, encouraging all people to reject false ideals, set higher goals, and demand more from themselves to further this unification. Lead singer and guitarist, David Hinds’ creativity, human persona, and visionary views are revealed through inspiring compositions that capture the effects of the African Diaspora. These songs weave and interlock with each other, enticing all to stand together and unite. The album begins with a continuation of past struggles in attaining freedom. From the opening song, “Rize,” one can hear, feel, and be uplifted through urgency established in its cadence. This urgency compels participation in the Windrush generation’s cause to rise against evil and controlling forces. Ancient melodies paired with catchy lyrics in “Stop You Coming and Come” transport the mind to a period of time where secrets of an African dynasty are unmasked. “Thank The Rebels” follows as a classic Steel Pulse anthem with powerful messages of awareness and inspiration. From the opening trumpet call, Hinds picks up the torch of wisdom, rallying humanity toward great aspirations. In “Justice in Jena,” rolling drums and repeated chorus structure highlight the hatred and racial intolerance that persists, despite the notion that society has progressed into a post-racial world. Haunting organs and eerie guitar interplay in “Human Trafficking” emulate the atrocities of this underground world, while desperate drumming and frantic horns bolster an emotional plea to admonish this horror. Mass Manipulation evolves and sets to navigate the political transformation of changing social and economic environments. Impassioned vocals convey the pain and suffering experienced throughout “Cry Cry Blood.” This song features blistering horns to help settle the nerves and uneasiness felt. “No Satan Side” follows with its intoxicating tempo, rhythmic chanting, and riveting lyrics, defining the African Diaspora with redemption cries for, “Rastafari and live.” “N.A.T.T.Y (Natural And True To Yourself)” explodes with syncopated drumming and purposeful bass to unburden the soul. It is here where we find Hinds at his most personal and reflective state. The album’s title track, “Mass Manipulation,” positions exploding horns to drive home its warning, bursting the corporate glass which would serve to protect the deceitful and corrupt. In “World Gone Mad,” a jolting rap broadcasts the horrifying consequences of madness. Ensnaring drums and seducing bass encapture those evil and controlling powers embodied in “Black and White Oppressors,” while defiant lyrics, weaponized with energetic horns, serve to penetrate Babylon’s evil and systematic ways. The album comes full circle as Steel Pulse’s legendary musical abilities aim to achieve a greater community for all. The promise of mankind’s salvation is prominently positioned with vocals offered to still calm in “The Final Call.” Stunning harmonica jousts invoke inward reflection and set free courage to conquer. “Higher Love (Rasta Love),” a beautiful Hinds reggae reinterpretation of Steve Winwood’s “Higher Love,” exudes charisma and energy hailing for love across humanity. The album crowns with “Nations of the World.” Stabilizing lyrics, enforced by a commanding rhythm, beg freedom fighters, leaders, and citizens from all nations to come together in peace. In the midst of today’s strife and turmoil, Mass Manipulation is Steel Pulse’s indispensable musical gift, as their forty year legacy continues to define the magnificent power and beauty of reggae music. As reggae revolutionaries, Steel Pulse is revered by the younger generation of artists and remains a powerhouse on stages around the globe. Through the example of Mass Manipulation, Steel Pulse demonstrates the endless possibilities that come from breaking down the walls of systemic greed and nurturing the fellowship of mankind. Steel Pulse initially had difficulty finding live gigs, as club owners were reluctant to give them a platform for their “subversive” Rastafarian politics. Luckily, the punk movement was opening up new avenues for music all over Britain, and also finding a spiritual kinship with protest reggae. Thus, the group wound up as an opening act for punk and new wave bands like the Clash, the Stranglers, Generation X, the Police, and XTC, and built a broad-based audience in the process. In keeping with the spirit of the times, Steel Pulse developed a theatrical stage show that leavened their social commentary with satirical humor; many of the members dressed in costumes that mocked traditional British archetypes (Riley was a vicar, McQueen a bowler-wearing aristocrat, Martin a coach footman, etc.). The band issued two singles — “Kibudu, Mansetta and Abuku” and “Nyah Love” — on small independent labels, when they then came to the attention of Island Records after opening for Burning Spear. Steel Pulse’s first single for Island was the classic “Ku Klux Klan,” which happened to lend itself well to the band’s highly visual, costume-heavy concerts. It appeared on their 1978 debut album, Handsworth Revolution, which was soon hailed as a classic of British reggae by many fans and critics, thanks to songs like the title track, “Macka Splaff,” “Prodigal Son,” and “Soldiers.” Riley departed before the follow-up, 1979’s Tribute to the Martyrs, which featured other key early singles in “Sound System” and “Babylon Makes the Rules,” and solidified the band’s reputation for uncompromising political ferocity. That reputation went out the window on 1980’s Caught You, a more pop-oriented set devoted to dance tracks and lovers rock. By that point, Steel Pulse was keen on trying to crack the American market, and went on tour over Island’s objections. Caught You was issued in the States as Reggae Fever, but failed to break the group, and they soon parted ways with Island. Steel Pulse moved on to Elektra/Asylum, which released an LP version of their headlining set at the 1981 Reggae Sunsplash Festival. Their studio debut was 1982’s True Democracy, a generally acclaimed set that balanced bright, accessible production with a return to social consciousness. It became their first charting LP in America, making both the pop and R&B listings. The slicker follow-up, Earth Crisis, was released in 1984 and featured producer Jimmy “Senyah” Haynes subbing on guitar and bass for founding members Gabbidon and McQueen, both of whom left the group by the end of the recording sessions. They were replaced by guitarist Carlton Bryan and bassist Alvin Ewen for 1986’s Babylon the Bandit, another Haynes-produced effort that ranked as the group’s most polished, synth-centered record to date. It featured the powerful “Not King James Version” and won a Grammy for Best Reggae Album. In 1988, Steel Pulse released State of Emergency, their most explicitly crossover-oriented album yet. They also contributed the track “Can’t Stand It” to the soundtrack of Spike Lee’s classic Do the Right Thing. In 1991, they released another heavily commercial album, the Grammy-nominated Victims, which featured the single “Taxi Driver.” Backing up the song’s views, Steel Pulse filed a class-action lawsuit against the New York City Taxi and Limousine Commission, charging that drivers discriminated against blacks and particularly Rastafarians. Founding member Fonso Martin left that year, reducing Steel Pulse to a core trio of Hinds, Nisbett, and Brown. Their backing band still featured Ewen and was elsewhere anchored by guitarist Clifford “Moonie” Pusey, keyboardist Sidney Mills, trumpeter Kevin Batchelor, Saxophonist Jerry Johnson and Trombonist Clark Gayton. The 1992 live album Rastafari Centennial marked the beginning of a return to the group’s musical roots, and earned another Grammy nomination. The following year, they performed at Bill Clinton’s inaugural celebration, the first reggae band to appear at such an event. 1994’s studio album Vex completed Steel Pulse’s re-embrace of classic roots reggae, though it also nodded to contemporary dancehall with several guest toasters and a digital-flavored production. 1997’s Rage and Fury continued in a similar vein, and was nominated for a Grammy. In 1999, the group released another collection of live performances, Living Legacy. 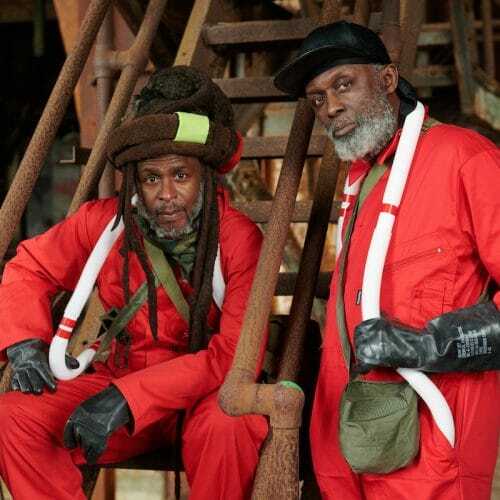 Fast forward a long seven years since their previous album, Rage and Fury, Steel Pulse would return yet again, this time with African Holocaust, and yet again have their ranks dwindled. Core members David Hinds (vocals, rhythm guitar) and Selwyn Brown (keyboards, backing vocals) are the only ones to remain from the band’s original line-up, but they more than hold their own and they’re joined by a deep roster of supporting musicians, a list too long to list. As always, the music is what’s most important, and on that count, this Steel Pulse lineup indeed makes the mark. Granted, it did take them seven years to get the album out, but still it won a Grammy Awards Nomination for Best Reggae Album of the year. There’s really not too much else to say about African Holocaust. Longtime fans will know what to expect. Newcomers should know a few things: above all, Steel Pulse are known for performing well-written, Afrocentric songs that are rebellious without being negative or inflammatory, and though the band membership has changed over the years, the type of songs hasn’t, nor has the steady move away from dancehall that was apparent on the band’s previous album. the message and music remain true to the band’s principles and vision. Steel Pulse is one of Britain’s greatest reggae bands, in terms of creative and commercial success. Steel Pulse started out playing authentic roots reggae with touches of jazz and Latin music, and earned a substantial audience worldwide. Their 1978 debut, Handsworth Revolution, is still regarded by many critics as a landmark and a high point of British reggae. By the late ’80s, Steel Pulse had won a Grammy and were working full-fledged crossover territory. They subsequently returned to a tough-minded, rootsy sound and have added touches of dancehall and hip-hop along the way.